Yellow peonies, and certainly double-flowered ones, will always have that special je ne sais quoi. But Paeonia Lemon Chiffon has an additional card up its stem. It starts out as a single-flowered peony but after a few years magically transforms into a double-flowered peony! Lemon Chiffon is a beautiful, summer yellow peony that is semi-double flowered for the first two to three years. After four years it officially becomes a full-flowered peony. Also the buds are large and the flowers can grow to be about 20 cm wide. Huge! This peony blooms early in mid-season, matures quickly and often suffers damage when grown outside. All that makes growing Lemon Chiffon a tough job, but also nice challenge. One that is well worth the trouble, because a double-flowered yellow peony should be part of every assortment! Paeonia Lemon Chiffon was registered in 1981 by the American breeder Reath. Two famous Lemon Chiffon ancestors are Salmon Dream and Moonrise, another yellow showpiece. 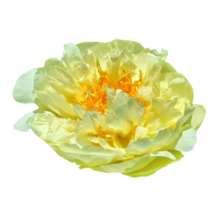 Lemon Chiffon is a challenging peony to grow and has a limited availability. Don’t wait too long if you want one!